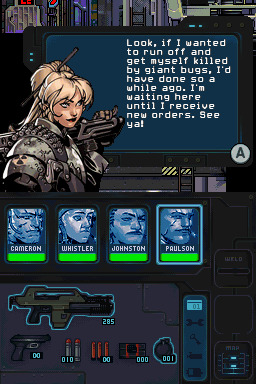 While I originally bought Aliens: Infestation for what I thought would be an interesting 2D action title, I was quickly surprised at how the devs, WayForward, stayed true to the source material. Taking place after the events of the second movie, Aliens, a four-person squad of Colonial Marines are sent to the recently discovered Sulaco floating in space, with the purpose of seeking out its supposed lone survivor, unaware of the grave situation. Here on out, the game is chock full of references to the 1986 classic, from various vehicles such as the dropship and weaponry that include pulse rifles, to equipment like the motion tracker and even the way Xenomorphs explode in pieces when you toss a grenade at them. All these little touches really help make you feel you're inside the Alien universe. Clinging on to a shred of faith, I figured, "Fine, maybe they'll be worth the wait." And whenever I obtained an item that granted me access to a new area, like timed explosives or a wrench (no, really), I usually backtracked a great distance on the map with the hope that something good would come of it. However, I was normally met with a reward unworthy of the trek, a measly health or ammo crate that can be found in every other two rooms. 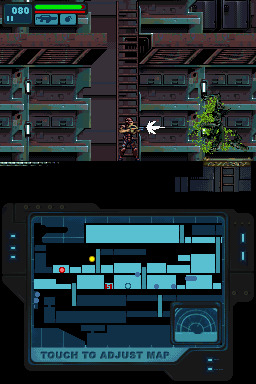 Not stopping with previously unreachable sections, the devs also pull red herring stunts on the countless array of vent shafts littered throughout, most of which led me through lengthy corridors that end with either, again, a normal item, or a dead end as a gift. Such an unusual waste of time and space if I ever saw one. So the level design is uninspiring and somewhat stupid, but at least we get to fight the Aliens in glorious combat, right? In the films, they're slick, unpredictable, and a threat you wouldn't want to come face to face with, and they're mostly portrayed like that in Infestation, popping out from the ceiling, ground, and detaching themselves from the walls. Joining them are chestbursters, facehuggers jumping from eggs, and on some occasions, robots and rival factions to give your squad a hard time. 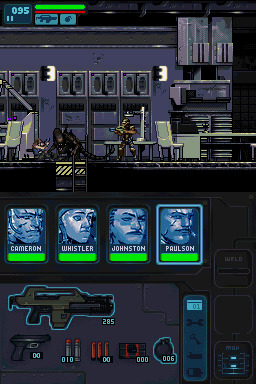 At first, the game feels like it's succeeding at giving players a thrill with enemies, as, with the Xenomorphs specifically, they make a mad dash towards your selected character, and if you're not careful, they'll pounce you to the ground, prompting a button mash to shoot them off. But after about an hour with the game, you realize that jumping out of a spot and running towards you is really all they do. Sometimes they'll crawl on the walls, but you should barely see this happen if you stick to the only strategy that's needed: stay at a distance and fire. How will you know when to fire? Oh, just use the game-breaking motion tracker introduced super early that pinpoints the location of every enemy on the map. You can turn it off for a more immersed experience, but by then, you already know their three methods of appearing, so having it off only makes it slightly harder. Also, considering in nearly every room you have ammo and health crates that respawn when you enter a sector again, plus an abundance of save rooms that instantly refill your necessities, you hardly fear for your life. The only real challenge occurs when you need to climb up or down ladders with an enemy hovering around it like a maniac in an attempt to whack you. It's really cheap, and happens a bit too frequently for it to be perceived as an oversight by WayForward. Other than that, the boss fights with tall, hulking Xenomorphs are honestly the only places you should die in Infestation. Here, platforms and cover are almost always nonexistent, so you just have to run past the critters during their frantic jumping and running patterns in a condensed setting. Worse, it's easy to exhaust all your good ammunition (there's infinite ammo for the weak pistol), so really, the only way to restock is to lose a life. 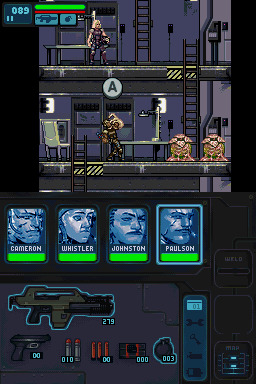 It's shocking how WayForward had a surefire hit of a concept, Aliens in a Metroid setting, and still screwed it up. They successfully managed to capture the spirit of the film with its visuals, sounds, certain text cues ("Stay Frosty! "), and shoot, there's even a mini-game where you recreate the knife scene with Bishop, but when it comes to the actual game, it feels like they were out of their element. I can imagine someone on staff thinking the exploration-style mechanics would be a brilliant fit with the license, got approved in a meeting, then crapped himself mid-development when he realized he couldn't execute it with finesse. I'm having deja vu. The most disappointing and misused aspect about Infestation, a thing I originally bought the game for, is the squad element. 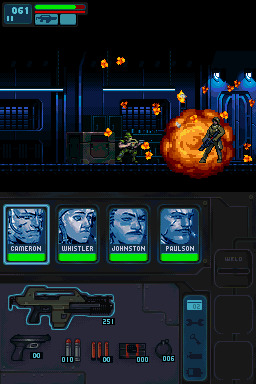 When I first found out you're in control of a team of four Colonial Marines, I figured this would make for an interesting aspect for a 2D action title. And, with what seems to be a reoccurring theme with the game, the excitement quickly dwindled when I realized you can only control one Marine at any given time. You can't switch on the go, only having the ability once you enter a save room. Oh, this also applies to your main weapons. Because I don't know. If the devs were going for a survival horror vibe, they failed horribly considering how generous they are with crates, the motion tracker, and save spots. Why bother with a team then? Well, when you lose someone in combat, you can then go searching around a map and find a stranded Marine to join you. This would actually be pretty neat if each person had their own special trait in battle, but that would be giving the game way too much credit. Instead, WayForward's "big catch" for the various characters is how they all have differing personalities that modify the dialogue during brief text boxes after picking up an important item or beating a boss. To phrase it another way: you start with four lives with attitudes, and if you lose one, you have to stumble around a spaceship until you find a 1-Up that talks smack. I honestly wish I could get back that feeling I had, before I owned a 3DS, where I looked at this game's box cover, saw some brief gameplay footage smashed together in a trailer, and thought that this could actually be a really fun release. Because, WayForward? You crazy. If you enjoyed this Aliens: Infestation review, you're encouraged to discuss it with the author and with other members of the site's community. If you don't already have an HonestGamers account, you can sign up for one in a snap. Thank you for reading! None of the material contained within this site may be reproduced in any conceivable fashion without permission from the author(s) of said material. This site is not sponsored or endorsed by Nintendo, Sega, Sony, Microsoft, or any other such party. 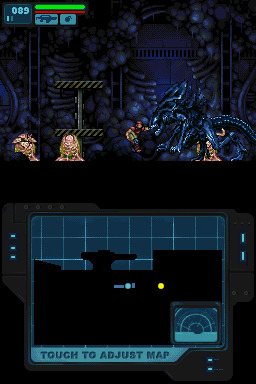 Aliens: Infestation is a registered trademark of its copyright holder. This site makes no claim to Aliens: Infestation, its characters, screenshots, artwork, music, or any intellectual property contained within. Opinions expressed on this site do not necessarily represent the opinion of site staff or sponsors. Staff and freelance reviews are typically written based on time spent with a retail review copy or review key for the game that is provided by its publisher.